Outdoor speakers are a great addition to any home, especially if you enjoy entertaining. When researching the best speakers for outdoor use, be sure to explore all the options and choose speakers that best fit your application. First of all, you’ll want to research “all-weather” speakers designed to withstand sun, rain, and even snow. A standard pair of speakers will not hold up against the outdoor elements over time. The best-selling outdoor speakers are designed to be attached to an exterior wall using the supplied C-style mounting bracket and stainless steel hardware. The most popular Klipsch outdoor speaker of all-time is the AW-650, which comes in a standard black or white finish. The white finish is easily paintable if you’re looking to match an existing exterior finish. Another option for dedicated residential or commercial zone coverage, is a landscape satellite and subwoofer package. You will need a dedicated amplifier to power the speakers. Klipsch makes two different Pro series landscape packages and amplifiers to power the speakers. The satellite speakers easily attach to ground stakes for an inconspicuous look, and the subwoofers guarantee impressive performance in half-burial or full-burial options. 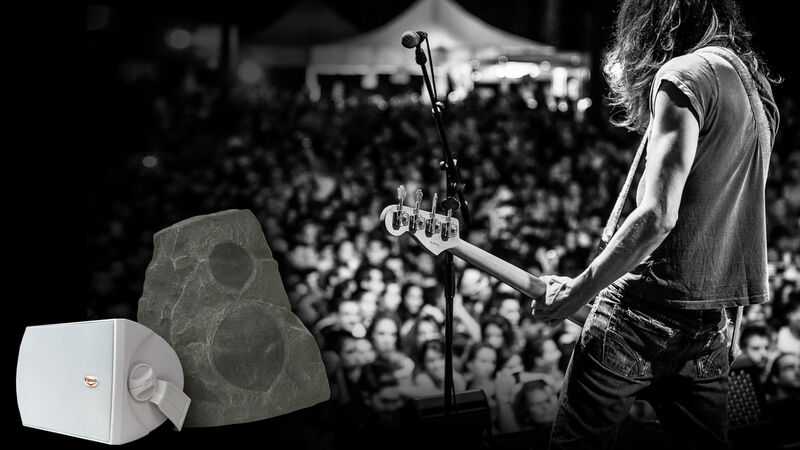 Be sure to explore specialty options, such as rock speakers which are great for integrating into the landscape. These can be placed in discreet locations, but you’ll need to run speaker wire underground. Klipsch offers two finish options in the AWR-650SM rock speaker - granite or sandstone. Audio coverage is very important so be sure you have enough speakers throughout the listening area to achieve the desired coverage. If you are concerned about the distance between speakers, single point stereo speakers, such as the AW-500-SM, are a great option to achieve stereo sound.